My husband and our February house guest, Del, think it's too early to break out the Easter decorations, but I like to get the party started. I love my alabaster Easter eggs. They add a pop of color in the breakfast nook and the dinning room. 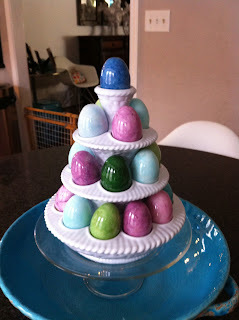 I used my Christmas present Williams-Sonoma gift cards to buy more alabaster Easter eggs in February. It works.